The following sets out the policies relating to the use of this website and the ThinkFlash!™ Palm Cards. The medical information contained in this Website and Palm Cards is for educational, non-commercial use only. The information does not constitute medical advice and should not be used as a substitute for medical advice gained from a registered medical practitioner. The content contained in this website and Palm Cards is not intended to be used to diagnose, treat, cure or prevent any disease or for therapeutic purposes. ThinkFlash Pty Ltd has made reasonable efforts to ensure that all medical content is as accurate and current as possible at the time of publication. However, ThinkFlash Pty Ltd makes no representations, warranties or guarantees of any kind, and assumes no responsibility, for the accuracy, reliability, or completeness of the information. To the extent permitted by law, ThinkFlash Pty Ltd excludes (and to the extent that such exclusion is prohibited, limits to the maximum allowable extent) all liability for any loss or damage including without limitation, indirect or consequential loss or damage, or any loss or damage whatsoever caused by reliance on any of the information contained in this website or the Palm Cards. ThinkFlash!™ Palm Cards are designed to supplement learning from textbooks on the topic of clinical adult medicine. They should never be used solely to learn concepts and technical medical knowledge. We recommend reading up on medical topics on relevant medical textbooks in conjunction to referring to the cards. The art of clinical medicine is very subjective and practices vary. 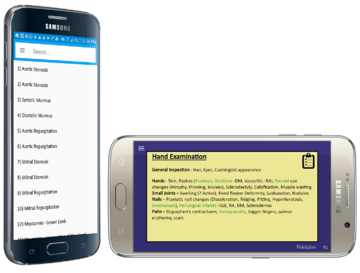 The ThinkFlash!™ Palm cards aim to provide a single template that represents one way of approaching the Clinical Examination. Opinions may differ on certain aspects of clinical signs and methods of examination. While every effort is made to ensure that information in cards is accurate, ThinkFlash Pty Ltd accepts no responsibility for differences of opinion - medical or otherwise. This website and its content including the Palm Cards is copyright of ThinkFlash Pty Ltd. Any redistribution or reproduction of part or all of the contents in any form is prohibited. You agree not to modify, reformat, copy, display, distribute, transmit, publish, license, create derivative works from, transfer, or sell any information, products, or services obtained from the website and Palm Cards. You may not, except with our express written permission, distribute or commercially exploit the content of the website or Palm Cards, or transmit or store such content in any other website or other form of electronic retrieval system. Every attempt has been made to trace and acknowledge copyright, but in some cases this may not have been possible. The publisher apologises for anyaccidental infringement and would welcome any information to redress the situation. If for any reason you are not satisfied with the product, please enclose it in its original box and send via parcel post to 8 Cameron Court, Willetton, WA 6155. We would appreciate your feedback if this is the case. Refunds will be processed provided the cards are returned within 2 weeks from the time you have physically received them. There may be a bank charge for credit card payment reversal.